According to reports, Michelle Obama's former chief of staff, Tina Tchen, who is also a close friend with the wife of former Obama official and currently Chicago Mayor Rahm Emmanuel, intervened in behalf of Smollett with the Chicago prosecutor, Kim Foxx, who dropped all charges. The Obama regime's protection of a black criminal has enraged the Chicago Police, who are demanding a federal investigation into Cook County's top prosecutor for dismissing the case after being contacted by Michelle Obama's aide. The president of the Chicago police union sent a letter to the US Department of Justice (sic) demanding an investigation of what appears to be a corrupt Cook County state attorney named Kim Foxx, who used her influence to get charges dropped against Smollett, who staged a fake attack on himself by Trump supporters. Initially the brainwashed Chicago police took for granted that Smollett was a victim of white supremacists. After all, what else do they hear from the presstitute media and Democratic Party? 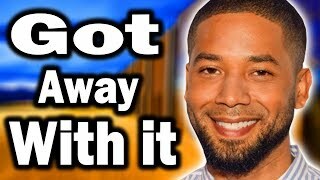 But when the police actually investigated, the police discovered it was a hoax and arrested Smollett for his felonies. According to a Breitbart news report, the Zionist Jew George Soros helped Kim Foxx with a $408,000 political donation "that supported Cook County State's Attorney Kim Foxx, whose office prosecuted -- and dropped -- the Jussie Smollett case." I can understand the revulsion, which I share myself, of the British, French, and Belgian colonies and Washington's empire. Colonies have destroyed Europe, and empire is destroying the United States. Nevertheless, Western Civilization before it was destroyed by its rulers was a human achievement of great promise. A government controlled by law with free speech to ensure the enforcement of law and to insure accurate information to the people in whose hands government ultimately resided. The collapse of Russia-gate has proved to everyone on earth except American Democrats that America is controlled by false explanations. It is America that is the dystopia of 1984, Brave New World, The Matrix. The American dystopia has corrupted Europe, which in its lack of self-confidence, has committed itself to America's path of destruction. Thanks to Soros, Washington's wars, and the EU, Muslims now look forward to a Muslim France. History is determined by self-confident people. Such people no longer exist in the Western world. They exist in Russia and China, which is why the moronic John Bolton's fulminations against these two powers are so comical. Does the idiot Bolton really believe that Russia and China are going to cower in response to his meaningless threats? Massive immigration of people who do not assimilate and the race and gender hatred taught by Identity Politics, Black studies, and Women's studies have destroyed the confidence of the American people, especially the younger generation of white males. A country is a mere geographical entity. A country can consist of mutual enemies. And so can "globalism."